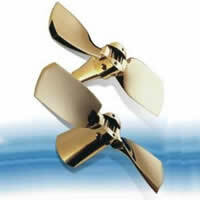 Propeller drag is reduced about 90% compared to the traditional two blade fixed propellers! The opening operation is automatic and is caused by the centrifugal force, increasing according to the engine revolution. In forward gear the pressure on the blades allows a performance equal to fixed-blade propellers. During this opening phase a quick acceleration of the engine is not advisable, and we recommend to make it smooth and gradual. Even at low revolutions the centrifugal force is enough to opening the blades. When the engine is off, a forward speed of 1 to 2 knots generates sufficient water pressure for the blades to close. Reverse gear has always been the main problem for folding blade propellers. Mainly due to the water pressure acting in opposition to the blades opening and the lack of a support point for the blades on the hub, only partially open, and the blades float, causing an unstable and insecure condition when maneuvering. In order to avoid this inconvenience we studied and tested special blade sections that allow the blades to remain fully open during reverse operation with positive maneuvering results. Made in a wide range of right hand and left hand rotation that will suit any hull and engine. Manufactured with accuracy and dynamically balanced. If well chosen, in addition to the best performance, they will eliminate any vibration and noise. Mounted with blades coupling by means of gears that ensure balanced opening and perfect closing during sailing.